When my friend, Padma, first visited a leprosy colony deep in the south of Tamilnadu, she had high hopes of being able to encourage the colony members to stop begging and begin small businesses by pooling their savings and then providing each other small loans, one by one. She met with a few women who seemed to be interested, but Padma wanted to involve every woman. She began to go door to door. There were a few men who were interested and so Padma included them, as well. But she was particularly interested in the women. The “homes” in this colony were really more like “apartments”. They had been built of cement by the government. The only difference is that these apartments had only one room. All four walls, floor and ceiling were formed by cement. There were no bathrooms, kitchens, or bedrooms. Cooking was done outside over open fires. Bathrooms were wherever you could find a private spot. The residents of the colony either slept outside or on a mat in their one room—often shoulder to shoulder. These rooms, about six feet square, generally were not burdened by furniture, with an occasional exception of a bed. The corners of the rooms held plastic or tin pots to collect water, a tin pan or two to cook food, and perhaps a couple of tin plates for eating. Some of the homes had a rope strung overhead to dry the ragged clothes owned by the family. Other than that, the homes were barren. Padma entered one of these “homes”. It was poorly lit but Padma could make out a lumpy shape in the corner. Intrigued, Padma looked closer and noticed that there were feet visible under the cloth. Could this be a hunched woman covered by a threadbare sari, as if someone had thrown a blanket over a piece of old furniture? Padma gently addressed the “lump.” There was no response. She tried again without any more success, except that the protruding feet disappeared into the lump. At this point a man entered the room from the outside. He seemed surprised to see Padma in his cramped little room. “What are you doing here?” he asked suspiciously. Padma told him she had come to speak to his wife. “Humpff”, he grunted. “Don’t waste your time. She’s mental! She can’t answer you.” He was clearly ready for Padma to depart. Reluctantly Padma turned away. Padma was haunted by the mental image of the woman hunched down in the corner of a dark room, with a piece of material thrown over her. She tried to think of a way she could get a response from the woman and perhaps break through the silence. A week later Padma was back in the colony to help people with their new businesses. 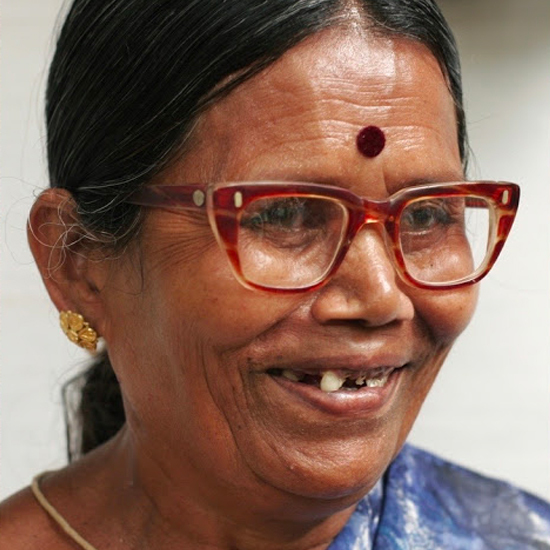 When she finished with the Women’s Self-help Group she had started the week before, Padma made her way to the home with the woman sunk into the corner. The husband glanced up as Padma entered. He was not pleased to see Padma back in his home. She quickly spoke up and said, “I have a gift for your wife.” She pulled a baby turkey out of the large bag that she had brought with her. The husband laughed and said, “She can’t have it—I told you—she’s mental. Refusing to be deterred, Padma set the turkey on the floor in front of the hidden wife. She gave the turkey a little nudge toward the woman. The man glowered at Padma, irritated that she wouldn’t go away. He prepared to order her out of the house. But the baby turkey had walked up to the woman and begun pecking at her covering. Both Padma and the husband were surprised to see the figure in the corner lift up the edge of her covering, push the turkey away, and pull the cover back down over her head. “See, I told you so”, the man said triumphantly. “She can’t have your gift, because she’s mental.” While Padma and the husband talked, the baby turkey had walked back to the hump in the corner and began pecking at her sari. This time the woman lifted up the covering, reached out, grabbed the baby turkey, brought it into her bosom and then immediately closed the covering back down to the ground. This time it was Padma who smiled! Nothing more happened, so Padma left. The next time Padma came to the colony an amazing sight awaited her. When Padma entered the woman’s home, she was amazed to see the woman sitting in the corner with her head uncovered, playing with the little turkey. She had apparently bonded with the little bird! Padma was so excited with this progress that the next week when she came to the colony, she brought the woman ten baby turkeys to raise as the beginnings of a micro-business. As I met with her I was struck by how confident she sounded. Her turkey business had been a phenomenal success. She was now the wealthiest woman in the colony. In fact, the month previously she had been voted the colony leader! What a contrast! It turns out that she was not “mental” at all. She had been so terribly depressed that she had just pulled the hood over her head and waited in the corner to die. Now she was a happy, confident woman.